"A rich, cheesy lasagna loaded with vegetables. 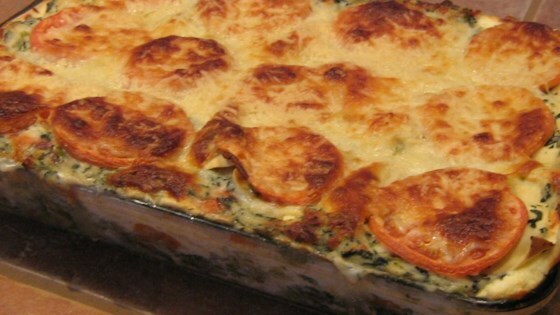 You could also omit all veggies except broccoli for a broccoli lasagna." Preheat oven to 375 degrees F (190 degrees C). Grease a 9x13-inch casserole dish. Place flour in a medium saucepan and gradually whisk in milk until well blended. Bring to a boil over medium heat. Cook 5 minutes, or until thick, stirring constantly. Stir in 1/2 cup Parmesan cheese, salt and pepper; cook for 1 minute, stirring constantly. Remove from heat; stir in spinach. Reserve 1/2 cup spinach mixture. In a small bowl, combine cottage and ricotta cheeses; stir well. Spread about 1/2 cup of spinach mixture in the bottom of the prepared pan. Layer noodles, ricotta mixture, vegetables, spinach mixture, and 2 cups mozzarella cheese, ending with noodles. Top with reserved spinach mixture, 1/2 cup mozzarella cheese and 1/4 cup parmesan cheese. I make a similar lasagna, if you want to make it more flavorful, substitute the sauce by adding a can of cream of celery soup to the ricotta cheese mixture, you will love it!